India’s Abhilash Tomy proving he in his element down in the Southern Ocean. 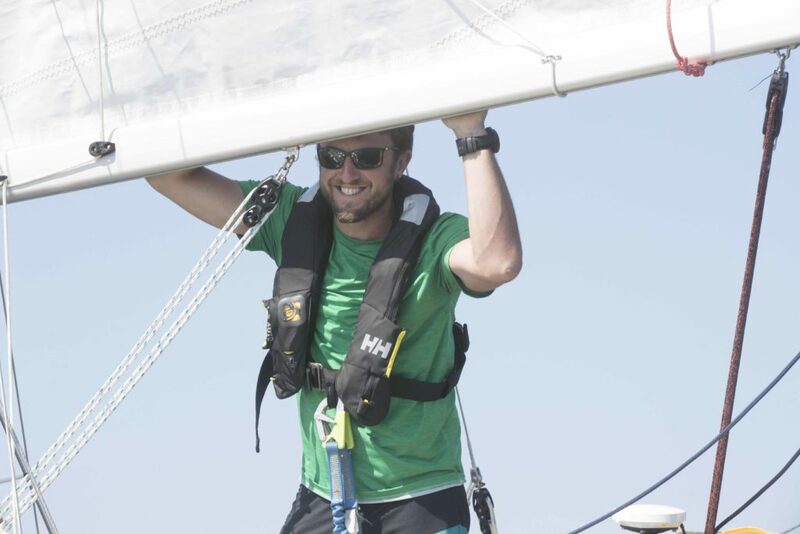 On day 71 as Jean-Luc Van Den Heede continues to set the pace across the South Indian Ocean, fellow Frenchman Loïc Lepage docked his Nicholson 32 Laaland in Cape Town, and Finland’s Tapio Lehtinen surprised himself and American/Hungarian Istvan Kopar by meeting up in mid-ocean. 73-year old Van Den Heede and his Rustler 36 Matmut now have a healthy 7-day lead over Dutchman Mark Slats whose rival Rustler Ohpen Maverick lost a further day on the leader this week. He now has Ireland’s Gregor McGuckin (Biscay 36 Hanley Energy Endurance) within a day’s distance behind after the Irishman clawed back 4 days this past week. 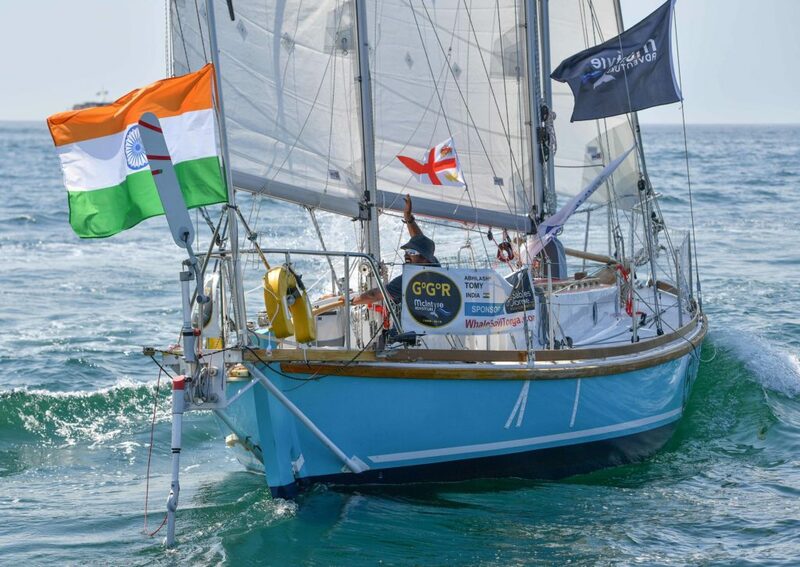 India’s Abhilash Tomy sailing Thuriya, a replica of Sir Robin Knox-Johnston’s Suhaili, winner of the first GGR 50 years ago, has also made big gains, overtaking Uku Randmaa’s Estonian Rustler 36 One and All at the weekend and move up to within a day of McGuckin. 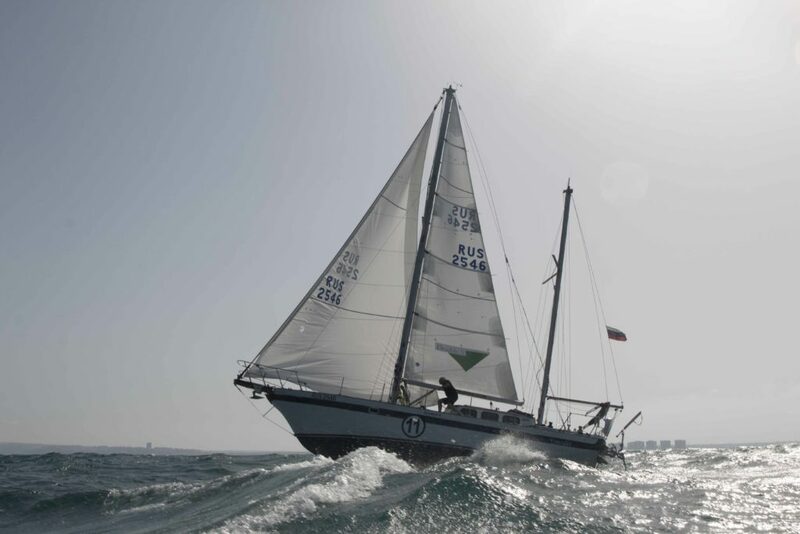 “This is fantastic…and just what I had hoped when conceiving this adventure three years ago” Says Race founder Don McIntyre, adding: “Now we have a Biscay 36 and a Suhaili replica chasing second place which shows that any boat can win. It is all down to the skipper and their preparations. Jean-Luc’s lead is a product of very careful planning, preparation and execution born from five previous solo circumnavigations. He is showing that age is not a factor. Igor Zaretskiy has been in a war zone too. The Russian requested medical advice last week after being thrown across the cockpit of his Endurance 35 Esmeralda and crashed against the liferaft. He was worried that he might have broken a rib or two but in stoical fashion, had no thought of stopping. Igor Zaretskiy called for medical advice after suffering a bad fall. Igor, who is expected to pass the Cape of Good Hope tonight, has also been plagued by the constant drip-drip of water leaking where the mainsheet track was torn away a few weeks ago, but this is nothing compared to the flooded hull Abhilash Tomy suffered twice last week. The Indian clearly had some respite yesterday, texting Race HQ: SUN APPEARED BRIEFLY LIKE RAINBOW AFTER BIBLICAL FLOODS. Whatever the problems, they are not slowing him down! 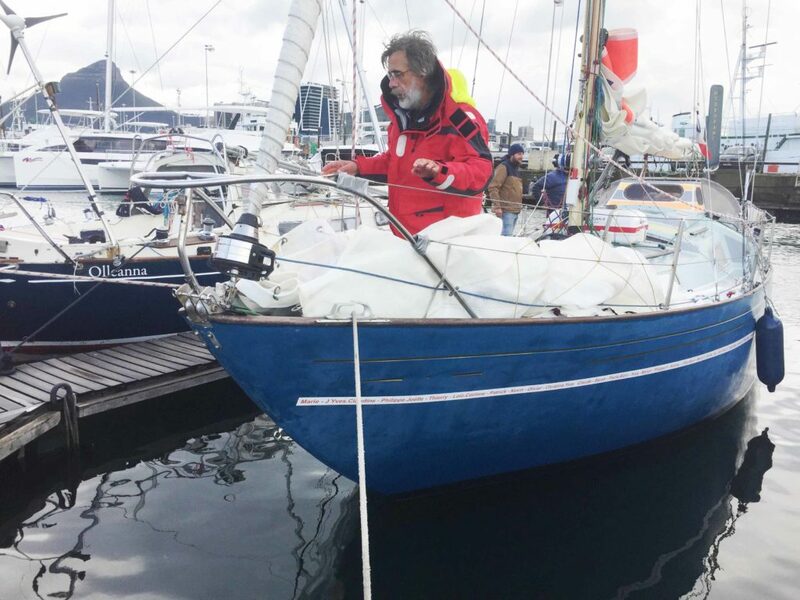 Loïc Lepage arrived in Cape Town last Saturday to replenish water supplies and have his SSB Radio, which he relies on to pick up weather forecasts, repaired or replaced. The Frenchman plans to resume in the Chichester Class for those who make one stop, on Wednesday. Australia’s Mark Sinclair is also planning a pit-stop off Cape Town to make an unscheduled film drop. The weather may conspire against him as forecasters predict a big storm sweeping in on Wednesday. He and the other tail-enders have been given a weather/current alert from Race HQ saying that this storm, mixed with the counter Agulhas Current, could produce extremely dangerous seas in the area around the Cape. On Sunday Tapio Lehtinen woke up to the more pleasant surprise of seeing Istvan Kopar’s Tradewind 35 Puffin within a mile of him. “WOW” was Tapio’s response to Race HQ. 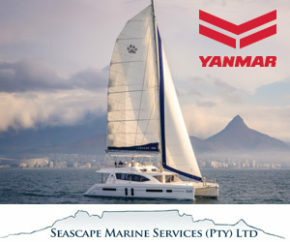 The two were 360 miles south of the Cape of Good Hope and by 08:00 today, were still neck-and-neck despite Istvan reporting continued problems with his wind vane self steering. Susie Goodall, whose Rustler 36 DHL Starlight is trailing in 6th place, has the problem, like those astern, of being a complete weather system behind those in mid-fleet. It will be almost impossible for her to regain that lost ground in the Southern Ocean and her only hope now is that those ahead make mistakes. 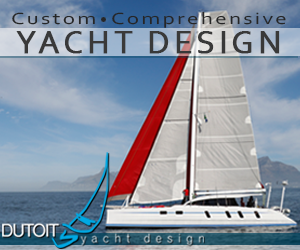 “Just 10 entrants remain in the Golden Globe Race. Seven will not pass the first Cape. 17 sailors pushing toward Hobart would have been impressive, but who really thought that would happen. Certainly not me. All true adventures have an unknown outcome. Before the start from Les Sables d’Olonne, I was surrounded by real adventurers from 13 countries with one common objective. They were setting out totally alone with no connection to shore support or open phone lines offering social and emotional comfort on the way round. This simple fact makes the GGR unlike any other round the world race since the first GGR 50 years ago. The Vendée Globe and Volvo Ocean Race crews can pick up the phone 24hours a day and ask for support from their mum or engineer. Not so in the GGR. When these sailors sailed over horizon, they gave up every aspect of a normal life. Just like 1968, they are as alone and unsupported as you can possibly be. It was all too much for some and they are no longer sailing. Each has a story to tell of their investment in a dream. It could be said that all but Are Wiig were beaten in their mind well ahead of any equipment failures. Sir Robin Knox-Johnston on Suhaili was super human with a drive and passion that remains hard to believe, and is harder still to replicate 50 years on. Ireland’s Gregor McGuckin is closing fast on second placed Mark Slats. Today our values are totally different and the results are starting to show it. Jean-Luc Van Den Heede knew what was needed and is doing just that. His boat, the equipment, the food and the fun are all much better than in 1968. The challenge is the same, but with one huge advantage – he knows it can be done. The challenge is to do it faster! My weekly phone calls to each entrant continue to evolve. They are now softer and slower. The skippers cling to the last word and do not want to go. You hear it in their voice, questioning their existence in this game. They try to brave-face their situation since they know the world is listening. They want to project ‘ALL OK’ and are strong, but little things hint at personal struggles. Her boat is OK, yet Susie Goodall gives a few hints when her conversation sounds a little down. With genuine emotion, Uku Randmaa declares ‘IT IS HARD’! That’s not the sailing… he’s referring instead to the emotional challenge of real isolation from life, family and friends. Mark Slats is a tough giant now softening over time. He wants to talk and not hang up. Tapio Lehtinen is a window to happiness – and sadness. He is absorbed and emotionally involved in the beauty of his surroundings and forgiving of anything else. His Gaia 36 Asteria is now without power, but a yacht does not need electricity. He will not stop. Loïc Lepage has been desperately alone with no radio and no news. He misses family. To be safe and sure he headed to Cape Town for a safety pit-stop. Bravo! …A proud CHICHESTER sailor. Loïc Lepage, arrived in Cape Town last Saturday and is now in the Chichester Class. A call from Abhilash Tomy offers more than just words. ‘IT IS NICE TO TALK WITH YOU TODAY’ is delivered with a quivering voice. It is humbling just to listen. He understands that 14 weeks in the Southern Ocean brings no guarantees! He has completed a solo circumnavigated before, but not like this, in a little boat, cut off from the outside world. All is always OK for Igor Zaretskiy and his Esmeralda. He laughs loud. With Capt. COCONUT (Mark Sinclair) I’m not so sure. His calls give nothing away. He is on holiday and always happy. Istvan Kopar is the same. When he talks of his challenges, and there have been many, you can hear his smile! Gregor McGuckin displays a youthful determination – an Irish guy going places. Without realising it, Are Wiig became a headline banner for honest seamanship and the Spirit of the Golden Globe. Strong as an ox, he and his boat took a fall! It shocked us all, but that is the way of the sea. He sailed himself home (for which we are all proud) and praised the GGR regulations and Race family. Ertan Beskardes, Kevin Farebrother, Nabil Amra, Philippe Péché, Antoine Cousot, and Are Wiig have all gone. We miss them but understand. We admire Loïc Lepage, now in the Chichester Class… And we salute the final 10. The Golden Globe is a tough journey like no other. Is it a ‘voyage for madmen’? NO WAY! But there are hints of real parallels to 1968 even to the type of pressures that played on Donald Crowhurst.